Do you have the title and author of an article and just need to get to the full text of that article? Google might work, but often doesn't if you are off campus or the article is available at a site not indexed by Google. type the journal title into the correct box, add the year of publication, and as much other information as possible. For full text items, click the "full text online" link to go to the full text of the article. If you see the Penn State "GetIt" menu and you need to click the word "article" to get to the full text. If there is no "article" link, click the word "journal" to get to the journal page and look for the correct year, volume, issue and pages for the article you need. Tip: Save the relevant sources into the LionSearch temporary folder by clicking on the small folder icon to right side of the item. When you are finished compiling your sources, click on the folder icon at the top of the screen and email or print (which allows you to copy into your clipboard) the references so you can easily add them to your project. CAVEAT: computer systems make mistakes when auto-formatting. Double check your final paper against the appropriate Citation Style! Don’t lose your work! Unless you sign up for Refworks, items are saved in LionSearch ONLY for your current session. You won’t be able to go back later and see a list of saved items. 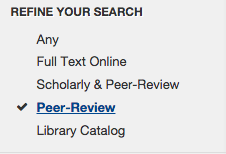 Select Scholarly & Peer-Review under the Refine Your Search limits on the left.